When my kids were born, my husband created little fact sheets about their birthday. There were events from that month, information about cost of living, sports news, the year in music, the year in movies and famous people that shared the birthday. He laminated them and we included them in their baby books. 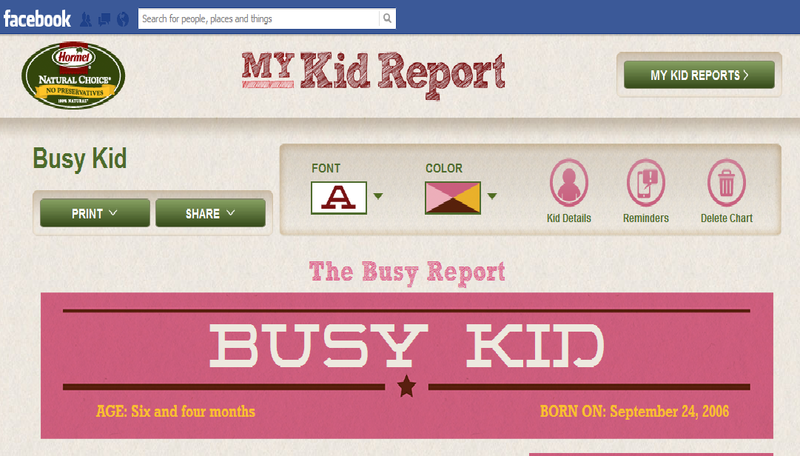 Recently, I learned about a fun little app on Facebook - the new Hormel® Natural Choice® “My Kid Report” - that allows you to create fun infographics to keep track of all of your kids "firsts, favorites and feats.” It is a cute little application, that probably works best for the 5 - 6 year old set (based on the presets that you can choose between). Head over to Facebook and check it out with your kids. Well first of all glad to see you here blogging. I was absent for awhile due to health reasons, only to come back and find so many deserted blogs. So glad to see you here. How cool is this! Can't wait to try it out! I haven't heard of this app on facebook. This seems interesting since I am fond of compiling a little of anything that reminds me how my kids are growing.